"Then the Commander of the Lord's army said to Joshua, 'Take your sandal off your foot, for the place where you stand is holy.' And Joshua did so." -- Joshua 5:15 (NKJV). Made to be worn by the faithful and crafted with the utmost quality, our titanium Christian Cross Dog Tag is bold and stylish. Measures 1 3/16" tall x 7/8" wide. Comes with 20" stainless steel military-style chain. 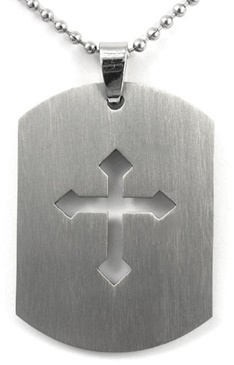 We guarantee our God's Army Titanium Cross Dog Tag Pendant to be high quality, authentic jewelry, as described above.